Are your RJ-45 connectors UL listed? Does your Cat-5 wire have the required “LP” markings every two feet printed on the cable? The new 2017 National Electrical Code is coming and it isn’t a pretty sight. Everything connected to the electrical network must be “listed” and must be installed by a licensed electrician once the new 2017 National Electrical code is adopted by your state. Wire requires new “LP” markings. Even punch-down blocks are required to be tested by a “listing agency”. 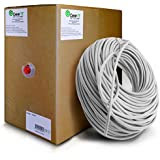 There are new regulations for wire bundle sizes. Cable trays are considered to be electrical wiring and must be installed by a licensed electrician. All wiring of all voltages are now regulated. Get ready! Get your 2,000 of “supervised instruction” so that you can get your low voltage electrician’s license before the new code is enforced in your jurisdiction.